Here at Paracord Planet, we are slightly obsessed with paracord. Okay, okay! 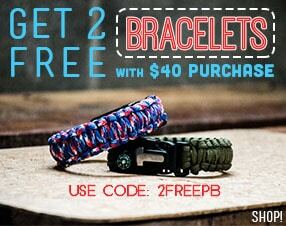 We are crazy about paracord! Paracord is a very useful and crafty product. When I was younger I said, “ Duct tape and paracord is the earthly key to just about everything!” Quite frankly, I still feel that way. That being said, paracord is very helpful in most situations. 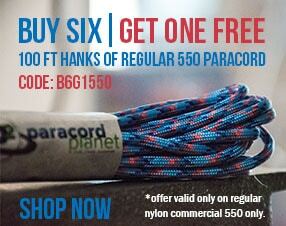 Paracordism is the study of survival with the amazing cordage of parachute cord, aka paracord. Yes, I just made the word Paracordism up, but it works and sounds really outdoorsy and cool. As a survivalist and outdoorsman, I have found paracord to be very helpful in a survival situation. Paracord can be used to build shelters, build snares, build deadfall traps, make weapons, and even can be used as fishing line and bait! The problem is that people often end up in a survival situation without paracord. It’s not like you can just carry a big huge bulk of paracord in your pocket, can you? Well you probably could, but it is not very convenient. However, you can solve that problem real fast. I have included below a list of convenient ways to carry paracord with you 24/7. Some of the links I have included above are some of my favorite survival paracord projects. I would recommend all of article links for your reading.Paracord is one of the most essential items you can have in a survival situation. Carrying paracord at all times is so ideal, just in the event you may need it. Every week, be sure to read my up-coming paracord survival articles on the following: building snares, building deadfall traps, making weapons, building shelters, and making fishing gear and traps. This is Paracordism 101…Oh yeah!! About Blake: Blake Alma is an award-winning writer and a published author. He is also the founder and managing editor at The Art of an Outdoorsman. He is only 15 years old! Blake began writing at the age of 7 and he published his first book, The Outdoorsmen Bible, at the age of 14. Blake loves the outdoors and its Creator like none other. Every day he tries to find way to make the outdoors more enjoyable in this world of technology and distractions. He shares the wonders and pursuits of the outdoors through his writing, websites, videos, and radio show. Blake is the host of The Outdoorsman’s Art Radio Show on WRVO Radio. Some of Blake’s favorite outdoor activities include survivalism, trapping, hunting, fishing, and camping.